A few readers found it selfish, and I can see why it seems that way. It sounds like advice to put your needs before the needs of others. And maybe it means that, in some way. 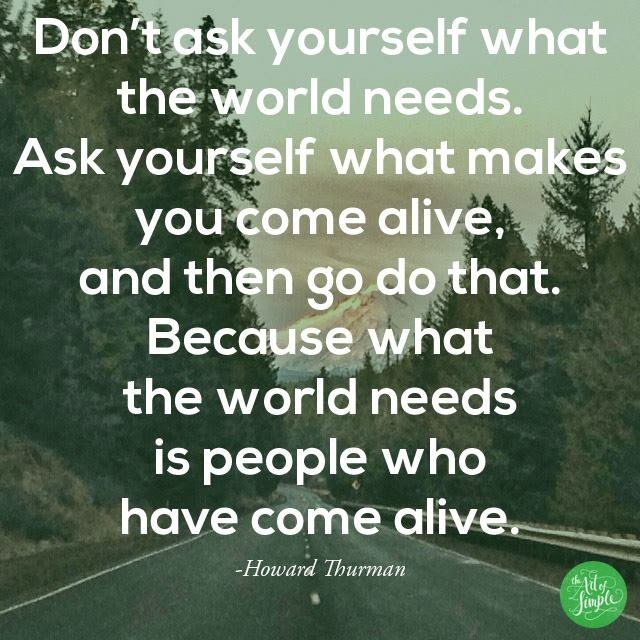 But I read it as this: what makes you come alive is, in fact, what the world needs. It’s easy to walk through the ins and outs of our weeks and months with a bit of numbing potion rubbed on our bodies—wake up, do this thing, then the other thing, rinse and repeat. Run errands, help with homework, log hours at the office. Day after day. Now, there’s beauty in the everyday and in the small, so don’t get me wrong—I’ve come to appreciate the liturgy infused in my normal routine. But I often fail to recognize the liturgy itself, and that causes me to go a bit slack-jawed with malaise, too tired or too indifferent to the still, small stirring inside me that brings forth life. But when I turn off the Spotify, when I stop the mental trails of dinner plans and play dates and work assignments, when I find a little quiet space for my brain and heart to do some dancing… I can sense a tap-tap-tap of life. I can hear God whisper to me ways and reasons He’s breathed into me life. And it involves, quite naturally, those things I can’t stop thinking about.